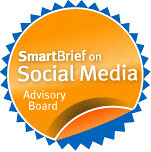 I couldn't sleep and was up early and Maria Thurrell and Tori Tucan told me about this micro-philanthropy (#5 on Lucy Bernholz's buzzword list) on Twitter to support Breast Cancer. The idea is the Twitter version of "Click for Breast Cancer" You follow this Twitter user @mrsrosey and she will donate $1 dollar to Susan G. Komen Foundation for each follower. There is no other information about the identity of mrsrosey, and she isn't asking for my credit card or for anything too time consuming. So, I took a leap of faith based on the recommendation from Maria Thurrell and Tori Tucan who I trust. As of Friday, December 12th in the morning, she had 170 followers. It will be interesting to watch how fast this spreads. Trust appears to be an important factor in the velocity of spreading something on Twitter. What would you do? Take a blind leap of faith based on the recommendation of a friend or stay away because you don't know the fundraiser? Yes, people will follow if you donate a dollar. I did. How much of anyone's real identity do they put out on Twitter? What if she had a real-sounding name and only four posts? What if she had a real-sounding name and her posts consisted of "Cool people @whoever, @whoeverelse, @whoeverotherperson" like countless celebrities? What if Obama donated a dollar for every new follower? You KNOW it's not Obama doing the tweeting, but you'd follow, wouldn't you? That's celeb power. This is something other. This is about the draw of doing good easily vs making a personal connection. I don't actually need more personal connections right now. I don't really WANT to make personal connections with more strangers on Twitter (I'm following 700 and find that adequate at the moment). I would, however, like a dollar donated to the Susan G. Komen foundation because of something I did. What do you want: a new friend or a dollar's donation? Seems to me if you keep your expectations in check, this could be win-win (assuming, always, that she isn't lying and in my experience people are quite happy to lie using their real names). amyrsward: @magitam super points! isn't that twitter 101? amyrsward: @nwjerseyliz that's an great point! really glad you brought that up! what do others think about @msrosey's fundraising campaign? amyrsward: @nwjerseyliz exactly - fundraising CAN be personal and direct and be successful. do you think people/orgs are forgetting that lately? nwjerseyliz: @amyrsward I just have this thing against companies offering to donate pennies if you buy their merchandise. Rather send in a check myself. There's also nothing to say that you can't unfollow her after she makes the donation. Which, frankly, I fully intend to do. After all, she said each follower she GETS, not each follower she KEEPS. Easy come, easy go. Now, if she wants to hang on to followers, she'll have to open up her posts to them, obviously. But I doubt there's a "real" person or real account there. I think this is pretty obviously someone experimenting and willing to pay for the privilege. Don't over think the model - @mrsrosey has declared on her website http://allrosey.com/ (now down for upgrades) that she will reveal her identity in the New Year. According to the website she is an award winning actress - THE PLOT THICKENS. I'm going with @mrsrosey until something proves me wrong. What I see right now is a disruptive and creative campaign. This is a steep learning curve for all of us. hmm.. Can't say I agree with you raincoaster.. Whilst it's a nice token gesture, to follow someone, sooner or later the limits of twitter make you realise you have to be more selective with your following. Unless more than 2000 follow you, you can only follow upto 2000 people, which for most people probably isn't a problem just yet.. but give it 6 months, a year, I'm sure over time people's networks will start to reach that limit. I just got there faster, because I happen to be interested in many different twitter communities. Anyways, when you hit ur limit, and have to start choosing who to follow, you quickly re-evaluate who you would choose to follow. People more selective than me, would probably judge earlier. Basically, if I'm following you on twitter, I'm letting u have my attention. It's like opt-in emails, only these are quicker, shorter, and way more personal. I'm not going to appreciate being sent an SMS just to donate a dollar, and the same goes for pollution of my twitter feed. I pre-screen everyone I add, and will often not add people, if their twitter feeds are of little or no value, the person isn't interesting, and I have no relationship with the person. Focussed campaigns using an engaged audience on twitter, are far far more effective, but that takes real effort - since you have to be yourself, and give something of value. If 1000 ppl all tried the same ruse, you'd soon be following 1000 potentially useless twitterers, all in an attempt to "help" another good cause. Tell me what you're doing with the money, tell me how things are progressing, become a voice for your cause, and I'll probably be really interested, and engage. My engagement with you is more valuable than my dollar, because you may find you don't need the money as much as some skill, resource, or expertise I have, that I'm willing to offer to you, for free, because I now know what you do, how you're doing it, and might know a better way of doing it, that could end up saving money. Donation of money is one way of showing u support something, but what's the point? to just get more money? or to correct the actual thing that's wrong? I think for too long, we've been conditioned to believe just giving money is enough. I'd say no - we need to know what the money goes to, how it helps, and the more you share your work, and what you do, the more likely I am, to be interested in wanting to invest in ur cause. I would be very skeptical and definitely wouldn't do it. Almost sounds like a bad chain letter that uses a sob story to get you reeled in, but twitter-style. Farhan, I think I need to introduce you to Tweetdeck. Actually, I'm working on a paper about etiquette in emerging social media forms like Twitter and what you've got there is a Facebook/LinkedIn model. The currently dominant principle on Twitter is you follow everyone who follows you; it's only polite. Literally; this is what politeness is defined as in the new virtual society of Twitter. Following is not an endorsement; it's more like shaking hands with someone who extends their hand to you. Snubbing it is a Big. Deal. The emergence of Twitter filter apps like Tweetdeck and Twhirl have brought about this change. They enable you to follow plenty of people but pay attention to only whoever you really like. Sign me up with the skeptics. The anonymous approach isn't trust-inspiring. Why not just donate $2.00 yourself? One of my twitter crowd asked the question "should you block or ignore spammers who follow you?" yesterday. I say, block them, because my icon on someone's list of followers does say something about me, and I'd rather it not say that I'm naive and a potential mark. How many new spammers start their assault either with another spammer's list of followers, or some popular page like, um, @mrsrosey's? @mrsrosey should have a picture and link on her site, because, even though she is likely legit, she could be absolutely anyone doing anything. 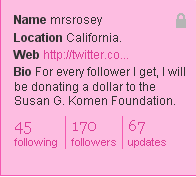 When I first saw the tweet about @mrsrosey I clicked through to her profile (updates were not protected at that time). When I saw that she didn't have a profile picture I went back to my stream. But then I saw a bunch of people that I know and truest retweeting about her. So, I decided to follow. Perhaps @mrsrosey isn't authentic. Maybe this is just a ploy to get more followers. But I figure, I can always unfollow. And what if she is for real?! One little click and I've contributed to Susan G Komen. Sweet. @mrsrosey doesn't have any more information about me now than she did before I followed her. She has the option to dm me now, which she hasn't done yet. And I quite like her tweets. So, while my skepticism flag has been raised a little (lack of avatar, website, not following everyone back and now protected updates), I figure, what do I have to lose? And there is the potential of something to gain. So why not follow?! For those of you who said they would rather give the money themselves, then by all means, please do so! And now I'm going to contradict myself (kinda)--with all the being said, I strongly believe in transparency and authenticity on the web. Yes, I may have followed @mrsrosey on Twitter but that is where it will end for me (at least for now). Far more trust (based on authenticity and transparency) would be required for me to take further action. I really dislike these kind of "comment/follow/sign-up and I'll donate a dollar" schemes. If you want to donate, donate. It's just icky to tie it to attention for yourself. I love the idea, but I have trouble trusting someone who makes themselves so anonymous. Not even a website? First of all, if they're doing it in this public way, then there's some sort of motivation there. If they're trying to raise awareness about Breast Cancer, then link to the site. If they're trying to advertise their social media agency, fine. Just come clean about it. I'd follow this person without a second thought. It doesn't cost me anything. But before I start reccomending others to follow them, I want to know more. If this person really is serious and I have some sort of assurance that they'll do it (like they register it on The Point or something), then I'll not only follow them myself, but I'll do a mini campaign to get others to follow as well. Heck, I'd try to make them the most followed person on Twitter! But would they really donate $45,000 if they got 45K followers? I need to know before I go on the march. I'm posting Tori's comments and apologize to you for any trouble you're happening with comments. I've sent a note into six apart to complain loudly. Wow this is utterly amazing to me that there is controversy about this! I'll admit, I was doing some massive tweeting about this last night and this morning, and I will continue to tweet about it because I think @mrsrosey is being very generous. I got in on this last night. @mrsrosey started following ME at 6:45pm (eastern time), most likely because I had recently done a tweet about breast cancer. At around 10:00pm I got online and saw her profile - wow! I followed her back and we went back and forth a few times last night. This was when her account wasn't locked, and her blog wasn't down. I'm guessing she has taken these extra measures for various reasons, which might include security/privacy for her family/etc? Who knows? I won't divulge what I learned about @mrsrosey last night in case her taking these actions means she doesn't want too much info about who she is getting out there -- but I honestly think she is just a legitimate person (celebrity) trying to find a creative way to get people involved in breast cancer research - an issue that has touched her personally. Yes, I could send $1 straight to Susan G. Komen, but honestly I probably wouldn't have because I am spending my $$ in other areas and on other fundraisers that are closer to my heart. But if SHE is willing to donate on my behalf, well then good for her! I am now feeling happy to be a very small "micro-volunteer" for Susan G. Komen, and I wouldn't have been otherwise. With 6.5 million people on Twitter (stat from @zyOzyfounder), there is some major potential here. As for the avatar, I recommended to her last night that she get something better than the "brownbox," and she swiftly sent out a call looking for somebody to design her an avatar (and she asked them to send her quotes, so she was willing to pay for it). @Tweetsgiving had a turkey avatar and no real name, and we all contributed $10,000 of our own money there - I'm sure not everybody KNEW who was behind it but we still did it and it was a great fundraiser. Who cares if we don't KNOW who @mrsrosey is? Do I really KNOW who anybody is that I follow on Twitter? I also want to point out that, because people are being skeptical, she is posting copies of her receipts for every $50 donation she has made -- or at least she was last night. She made two $50 donations last night with the followers she got. I wonder if the "secret sauce" to Twitter fundraisers is that they originate with a person or team of people who already have established a trusting network of followers? And @mrsrosey with her little group of 25 friends (w/in a private, locked Twitter account) didn't cut it? She went public with this account and mentioned in a tweet to me last night that it was "scary" to go public -- I wonder why she decided to lock this one down, and whether or not it will remain so? I will be following this controversy closely....it's just amazing to me how complicated people are making this! (And I mean no offense, perhaps I am just way too naive/trusting??? hahahha, my husband tells me this all the time) :) In my perspective, this is a great way to spread awareness for an important cause. You know, I don't think there should be a trust issue here at all. It's not like you're risking ANYTHING by following a random person on Twitter. Worst case scenario is that this is a person just trying to get a ton of followers to get online attention. Best case scenario is that she follows through. You don't lose anything by following her on Twitter. But it's quite likely that the Foundation will gain something if you do. I wrote a http://communicable.ca/2008/11/22/microphilanthropymicrophilanthropy/>post on micro-philanthropy a while ago, and updated it with your example, seems to fit right in! I think it's a creative use of twitter and could be a good way to get visibility for nonprofits and organizations new on twitter. This kind of tactic makes me feel dirty, whether I play along or not. I'm kind of embarrassed to have read as much about it as I have. I think Tori makes a good point that the downside is not very bad, but still -- being asked to participate, in any way, in something I don't (and can't understand is not something I appreciate. Sorry- I meant Amanda's point, not Tori's. I am on the trust and verify side. I trust Beth but initially when I tried to check mrsrosey everything was locked down so I stopped. After reviewing the other testimony here I would be more inclined to contribute because of the additonal validation provided. I happen to know Mrs. Rosey(I will keep her name private in respect to her) and she is in fact a real person. She is someone who is doing something honest and genuine to help others. She isn't like every other person on Twitter. She isn't just looking to gain friends so she can she has this many or that many people following her. You people act like she is asking for money when she is actually donating money. But, apparently you people don't see that or understand that.